What. A. Night. In. Vegas. Thousands of nurses tuned into the first debate for the Democratic presidential nomination and to cheer on our endorsed candidate, Bernie Sanders. Before the big event, more than 200 RNs joined 200 other supporters and marched in Vegas, sending the message to the world that Bernie is the best choice for our country. 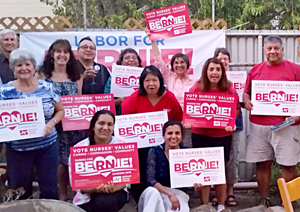 Hundreds of nurses attended watch parties around the country to see Bernie in action. And he did what he does best – spoke truth to power, which in this country means corporate America. "Congress doesn't regulate Wall Street. Wall Street regulates Congress," he said to applause. There’s no doubt Bernie won. RoseAnn DeMoro speaks to media in the "spin room." 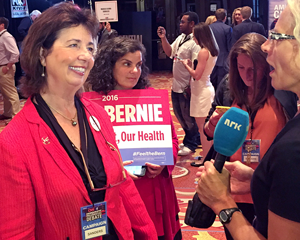 NNU Executive Director RoseAnn DeMoro attended the debate, tweeting throughout the night and talking with media afterwards. "@BernieSanders is inspiring from the start - authentic, insightful and passionate at #DemDebate. He gets it. #DebateWithBernie," she tweeted. It was an exciting night, and we are going to help continue building the momentum. Thank you so much for your energy, passion, and support. Remember, political advocacy is patient advocacy.